Do you make a list for the people shopping for your holiday gifts? I have one in my head, but haven’t given it to Joe yet. (I should do that!) 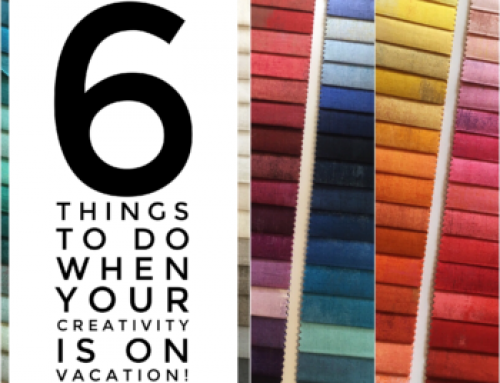 I thought today I would share a few ideas, some of my favorite notions and places to shop. Read on for ideas, and a giveaway! 1. Warm & Natural is my go-to batting! And I can never have enough – add a pre-packaged batting to your list, it’s easy to wrap and get under the tree. 2. Lapel Stick, this special glue stick, is so handy! Use it in place of pins when adding a zipper, or teaching your kids to sew. Makes a great stocking stuffer too! It’s original design is to quickly fix a hem, or keep the pesky strap in place. 3. Aurifil 50 wt thread has quickly become my favorite for piecing! It’s so smooth and soft, yet strong enough to sew at top speed! I recently found that the Fat Quarter Shop is selling individual spools, or if a set is more your style, visit Pat Sloan for a great selection. 4. Quilting pins from Clover are some of my favorite pins! If you have only used the 500 pack of pins, you are missing out! These super sharp pins glide through the fabric and stay where you need them. They are also strong enough to work with multiple layers of fabric and interfacing when making bags and such. 5. I’ve been using my micro tip scissors by Famore Cutlery for nearly two years, when my friend Kelly introduced me. The micro tip is perfect for so many applications – chain piecing to applique, you are set! And they are so sharp! 6. This set of fine Patchwork pins are so smooth. There’s no mark left in the fabric once removed, super sharp, and on the shorter side, to stay out of your way too! 7. After using, and loving the Micro Tip Scissors, I added the 4.5″ Rainbow Colored EZ Snips to my collection last month. And they are also fantastic! I’ve had my girls, willingly, taking turns snipping apart my chain piecing, they are simple to use and get as close to your work as you need to. 8. I have to suggest Modern Basics! I have 4 copies left in stock here if you would like a autographed copy, or visit Amazon for your copy. 9. Also, Modern Blocks is stuffed with inspiration, and a great addition to your list! I have the above items from Clover, Famore Cutlery, Warm Company, Lapel Stick and Aurifil to give away! To win, tell me about your favorite notion. I’d love needle suggestions for handwork – do you have a favorite? I’ll select a winner on Friday, December 9th, 2011. ** special thanks to Clover, Famore Cutlery, Warm Company, Lapel Stick and Aurifil, each agreed to send items for this post! 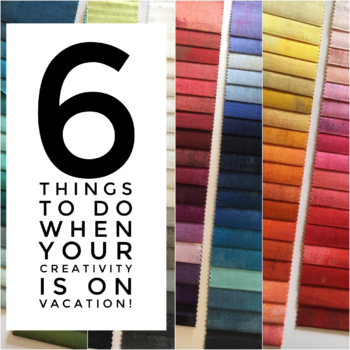 6 things to do when your creativity is on vacation! Hi Amy! Thank you for sharing your list and tips and for a great giveaway! To be honest I haven’t tried the real batting or the quilting pins and that clue is just what I have been missing when I make pictures and applique with small scraps! I would be so happy for any new notion or material! I have a lot of great sewing notions, but if I had to choose one that I couldn’t live without it would be my Olfa rotary cutter. What did we ever do before these came along? Do you remember actually cutting out each patchwork piece with scissors? I do. I never want to go back. My favourite notions are my pair of left-handed scissors: indispensable when one is sinister! and my conference freebie ruler with its tough plastic and pretty colourful astronomical images, which makes me happy every time I see it. I would have to say that my spray glue is something I would hate to live without. I never mastered the art of pinning so that I would have lovely quilting lines without it all bunching and pleating at the back. Thanks for all your tips and tricks that you share. Have a wonderful holiday season. Aurifil is definitely one of my favorite notions as is my rotary cutter. I really dislike cutting fabric and I can’t imagine doing it with scissors. Wow, thanks for the tips. I definitely was to try those micro tip scissors! My fav is probably my rotary cutter and mat that I use all the time. Love the warm & natural batting as well! Sorry I don’t do too much hand stitching so no suggestions for that. My favorite quilting notion has got to be my iPod. I put on a good podcast or an interesting book and lose all track of time and stitch away. Maybe that really isn’t a notion. OK…then how about my stiletto. I use it all the time. It is great for keeping the end of stitching from going sideways. I have been thinking about trying “the purple thing” but not sure. This is a great giveaway. Thanks! The ever present seam ripper may be my favorite because it bails me out often! I like to hand quilt so I look forward to the responses about needles. Thanks for the great giveaway. It is hard to choose just one thing, and I’m feeling like a rebel this morning, so I’m going to say two things, my little fiskars scissors that I keep next to the sewing machine. These get used every day, every time I sew. I’ve definitely gotten my money’s worth out of them. Second, I don’t know if a ruler is a notion, but I love love my Creative Grids 2.5 X 12.5 ruler. I remember feeling a little silly buying that small ruler, but it is another thing that gets used basically every day. It is wonderful for drawing lines across HST’s, giving something a quick trim to remove dog ears, or when rotary cutting a stack of small units. And of course it is great for measuring! When I doing something scrappy, I grab it to measure the scraps to see if they are large enough to use as I sort them out. This is one amazing giveaway! With as much as I’ve been using it, I would LOVE for my favorite notion right now to be my iron, but that poor thing is on it’s way out. I recently discovered the joys of starch and if it isn’t a notion, I don’t care because I am smitten! Thanks for the giveaway! My favorite notion is my Quilter’s Magic Wand – a fantastic 1/2″ ruler for marking perfect sewing lines for HSTs. You asked about needles? I love my John James straw needles. The needles glide smoothly and seem made to fit my hand. Love them! I don’t do much needlework, but my favorite notion is my rotary cutter! I’d have to say my favorite notion is my bamboo stiletto. It is so handy for keeping my fabric in line while sewing. I also have one of those purple thang things too. It seems to do the trick also. I just starting using that so we will see how it does! I need to cross the line and try the Aurifil thread. One of my favorite tools is my fabric snips. I also really love the warm and natural batting. Thanks for the idea about the pins! Thank you for a great list and the giveaway. My favorite notion right now are my embroidery scissors. They make snipping thread ends so easy. My newest favorite are the Clover Black Gold Needles. They have a size 12 that actually has an eye big enough to get thread into. A 10 for quilting glides “like butter”. My new favorite are the Clover Black Gold Needles. The 12’s have eyes big enough to put thread through and the 10’s for quilting are “like butter”. My favourite notion is my creative grid ruler (is that a notion?! ), anyway it’s brilliant! Needles for handwork? The black clover needles with the extra coating! They are worth the investment. And my favorite notion? It’s a combination of two: the TED’s thumb thimble and the needle puller. These are a great asset for hand quilting! I cant suggest a needle (im happy to use what ever is on hand). My favorite notion is 505 spray baste. So many uses, not just quilts. great choices for under the tree! My favorite notion is That Purple Thang – I use it all the time! my favorite notion? um… the first time i ever used a rotary cutter, i almost fainted with excitement, so i would have to say that one. Fabulous wishlist for quilters! I love them all, but my favourite is Auriful thread! I just started using it this summer and completely love it, even though it is difficult for me to get. Thanks for a great giveaway. Warm and Natural and Warm and White are my favorite battings. My most used notion would have to be the seam ripper! they are all so wonderful. I could use some new pins like you show. My favorite notion isn’t exactly a notion…I have a square pincushion glued to a larger square plate (think desert plate ) with enough room for my other notions I always seem to need…micro scissors, seam gauge, seam ripper; etc. That plate goes with me everywhere, to the ironing board, next to my TV chair, on the cutting table. I usually give out Christmas lists…which I accumulate throughout the year…things I would like, but don’t need. A rotary cutter first popped into my mind when I thought about my favorite notion…but close to it is my magnetic pin holder with lid…it’s so easy to take pins with me when I hand sew. I use the same pins you show and I adore Aurofil thread. It’s not available at the closest shop to my home so I have to stock up occasionally. I’m new to quilting so I have never tried the label pin glue. I plan on making my first bag this weekend! Whoohoo. I am totally in love with the June Taylor ‘Shape Cut’ ruler. You know, the big square ruler with all the slots cut into it. You just lay it down on the fabric, and cut at every increment you need, and you end up with perfect strips without ever moving the ruler! And if you turn it once around, and cut again, you have perfect squares! Yay! I LOVE IT! And I can’t imagine doing any massive cutting project without it! I recently did a quilt with 480 flying geese units (retangle with two squares), and I cut those all out in no time! I have the 12″ one with 1/2″ increments, and it’s perfect for everything I do! Thanks for all the great gift ideas, and for the giveaway! Sweet! I am totally in love with the June Taylor ‘Shape Cut’ ruler. You know, the big square ruler with all the slots cut into it. You just lay it down on the fabric, and cut at every increment you need, and you end up with perfect strips without ever moving the ruler! And if you turn it once around, and cut again, you have perfect squares! Yay! I LOVE IT! And I can’t imagine doing any massive cutting project without it! I recently did a quilt with 480 flying geese units (rectangle with two squares), and I cut those all out in no time! I have the 12″ one with 1/2″ increments, and it’s perfect for everything I do! My favorite utensil is “That Purple Thang”. For years I used anything with a point to push out corners and the like and yes, ended up, too often, with holes! But this thing is great, not only for pushing out corners without punching holes, but I find it most useful for helping my feed dogs. When something is small or wonky, I use the square end to help push the fabric through flatly! My favorite notion is my seam ripper! I’m still a new quilter, which means I still do a lot of ripping. This is a great list, thanks so much for putting it together! Amy, what a great list! My most handy tool – sounds silly I know – is an upholstery needle. I use it to draw up the bobbin thread when I replace my bobbin, like a stylus for guiding fabric, and if my seam ripper isn’t handy I can un-pick with it (it’s great for when you unpick just a couple of stitches as in the center of a fourpatch.) Oh, but you’ve got me coveting those rainbow snips, they look like a seriously good tool! 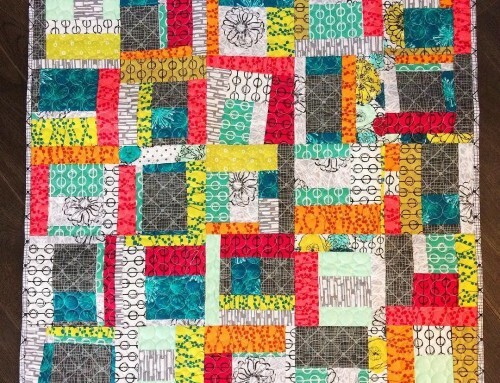 I use quilter’s betweens for handwork – I like a small needle for that kind of thing. I love my Ginger rotary cutter! Wow!!! Wonderful notions and such great tips Amy! Thank you!!! I have a few favourite notions – My seam ripper is a must :) haha, my olfa rotating cutting mat and I love my new Pilot Frixion pen! The only needles I can highly recommend is the Fons and Porter Binding needles. I do a lot of hand binding and these needles are amazingly the best! I would see if they have needles for hand applique and give those a try! I would have to say my favorite notion is my gingher snips. So sharp…they are great for cutting threads and seam ripping too. I love thread though too for my longarm…can’t seem to have enough thread. I’m going to ditto everybody else and say my favorite notion is my rotary cutter. I don’t know that I would be a quilter without one! And my snips, I can’t live without my handy little snips! Wow, great giveaway! I have to say, my favorite notion is my new titanium rotary cutter blade! I will never be without them again! I do like John James needle and as mentioneda above, the Pilot Frixion pens are ‘da bomb! My favorite notion would have to be the rotary cutter. Without it, I wouldn’t be able to quilt as I’m extremely lousy cutting with scissors! I have a pair of snips like those rainbow snips up above except mine are 1) not rainbow colored! and 2) lost!!!! Ah! I love those things, and I’m asking Santa for a couple more pair so I can always have at least one pair FOUND so i can use them! Have to agree with you on the warm and natural – love it. As for me, my favorite notion is probably the special sewing foot that makes a perfect 1/4 inch seam allowance every time. Don’t know if that counts, but it’s my favorite. My (new) favourite notion is my Hera marker! I find it so useful for marking quickly and simply! I recently discovered fabric glue sticks, and really like them. I am making a purse with appliqued pieces on the front, and the glue stick really helped me keep them in place for sewing! Rotary cutters and self-healing cutting mats, though, must be the greatest things ever invented for sewers and quilters! I remember all those years of making clothes for myself and my kids cutting with scissors on the floor. This is so much better, quicker and easier on the old back and knees…8-) Thanks for the chance to win some of these great notions. Those micro-tip scissors and piecing pins look quite intriguing! Received an error message when I tried to leave a prior comment, so I’m trying this again. Great wish list. I definitely would like some sharp scissors or Aurifil thread for Christmas. Yes, those are high on my wish list. Great wish list for any crafter! I love many of these same goodies. It’s hard to narrow down my favorite notion to just one – I really love my rotary cutter and my small Clover scissors and my seam allowance ruler. I’m going to have to go with the majority and say the rotary cutter. My first quilting project was entirely cut using scissors and I can’t imagine how anyone ever made precision cuts with them. I use generic needles for hand work, so I’m very interested to see people’s suggestions that might make my life easier. I’ve been converted to Warm & Natural batting. I bought some when it was on sale a couple weeks ago, but you can never have too much! i would have to say my, embroidery scissors & my rotary cutter. thanks for the ideas and the chance to win. I love the Warm N Natural and I’ve wanted to try the lapel stick. Thanks for the chance. I don’t know what I would do without my rotary cutter and rulers. I love my binding clips… Absolutely my favorite because they make hand sewing my binding so simple. Just finishing up the binding on my latest quilt – a Christmas gift for my in-laws. The binding is quickly becoming my favorite part of every quilt I do! My favorite is a small pair of bird scissors. Small enough to carry anywhere and sharp enough to cut any project. I love Warm & Natural too and buy it by the roll. My favorite notion is probably my rotary cutter and mat….I would have to have to pin and cut everything with scissors. Fantastic giveaway! I love my rotary cutter (Olfa) and self-healing mat. Can’t live without them! I have not found the “perfect” needles yet either. Thanks for the fabulous giveaway! My favorite notion is definitely my rotary cutter and super-large cutting mat. I also have a lip-edge ruler that is great for not shifting! My favorite notion is probably my seam ripper – I use it the most! LOL I also love my ruffler foot though! I like your list and giveaway! My favourite notion is the Hera Marker. It is a piece of plastic which leaves a simple crease in your fabric for you to follow when quilting. No more worrying about pencils & magic markers marking your fabric permanently! I love so many of my notions! Spray baste, spring scissors, thimble (for sewing down binding), and disappearing ink pen are all wonderful! I use Roxanne needles for non-embroidery thread handwork. :) Thanks for the giveaway! I love the Warm and Natural batting for all my quilts. I like it because it is low loft, easy to quilt through and has a very smooth finish. My favorite needle is a 10 between for my hand work, applique or sewing down my bindings. It is a short needles so I can also go far down with the thread. Thanks for the giveaway! 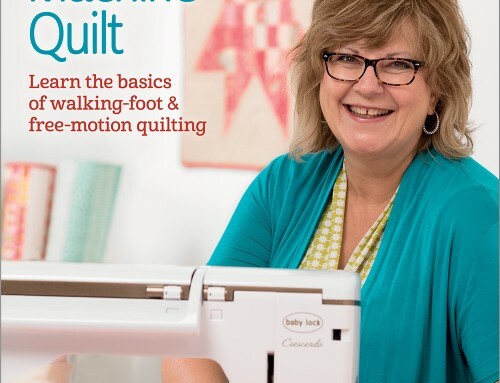 My machine is not specifically for quilting and their is no 1/4″ foot available for it. I tried a generic foot but it wasn’t so good. Then I discovered foam tape. I line it up and stick it just in front of the feed dogs and now I can have my perfect 1/4″ seam (or any other size). It is great for guiding the fabric. Thanks for the super list and giveaway. I couldn’t survive without my rotary cutter, but to me that’s a given. My other favorite notion is my Clover thimble with the rubber like sides and metal top–actually stays ON my finger! For needles, I like the Piecemakers brand–don’t seem to break or bend so much (both of which I seem to do often). Thanks for letting us learn about all the new favorite notions of others! My favorite notion would have to be my rotary cutter. Before I had this, I actually used to cut along the grain of the fabric, it took forever! Thanks for sharing your list. A couple of notions on your list that I have never tried that I can see I need to…the microtip scissors and the Clover pins. I like my chalk wheel and I have just bought a new ruler that actually doesn’t move when I cut the fabric. Awesome! Amy–thanks for your list! I was busy making one for my husband today and was having trouble coming up with some practical ideas. The Clover pins are perfect! I wish I could come up with a great notion idea for you, but I’m a pretty novice sewer. However, I do love a sharp, small scissors. I sew on my Mom’s old Viking (best workhorse of a machine!) and it doesn’t have an automatic thread cutter. I find that a sharp, small scissors is absolutely indispensable for trimming all those threads. Have a Happy Holiday! MY FAVORITE NOTION IS MY SMALL HARDANGER SCISSORS WITH SHARP POINTS TO HAVE CLOSE TO MY SEWING MACHINE.FOR NEEDLES I REALLY LIKE JEAN KIMBALL NEEDLES FOR ALL HAND QUILTING,APPLIQUE AND EMBROIDERY.THANK YOU FOR SHARING! MERRY CHRISTMAS! My favorite notion (at least I think it’s a notion…) is my magnetic seam guide. Love it! I hand quilt and have used size 7 quilting needles by Newey. I can’t find them anywhere anymore and would love a package or two if Santa could find them. I do have the Modern Basics book and plan on working through it in the new year. I’ve quilted for 31+ years but I have so much fabric that I thought it would be a good way to use some of it up. I follow your blog on my igoogle homepage and get great ideas from you thanks. Saw the wish list idea and wanted to read and saw your wonderful give away. My favorite notion is my Ginger gold handle scissors. They cut fabric like butter, mmmmmmm. 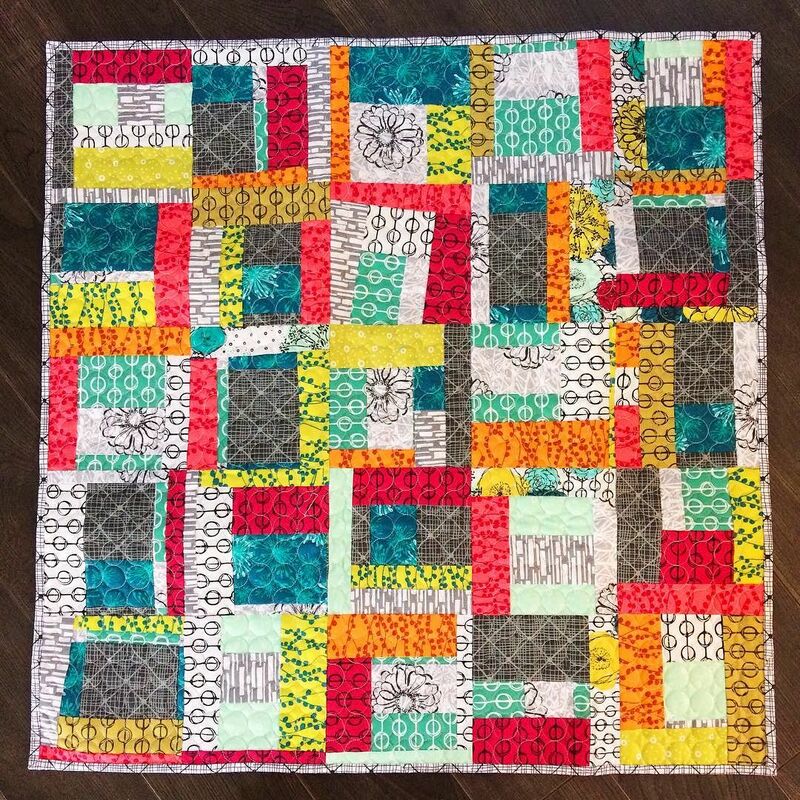 I am really new to quilting and love reading your blog. Thanks for the chance to win great items. From your list of notions, I would pick the lapel stick. I got something similar at the store, and followed your directions for a zippered pouch. It came together so fast and looked so professional and nice. What Great suggestions! I think my favorite tool/notion is my rotary cutter. I can’t imagine quilting without it. I remember my mom cutting scraps with a scissors, and using a piece of sandpaper as a template. yuck! Thanks for the chance to win. Working on my 2nd Modern Maze. I made the first one for my sister, but my husband said it’s too pretty to give away— So I’m making another identical one! What a great collection of notions! I would love to try Aurifil thread. I’ve heard only wonderful things about it. I’m not sure if this could be considered a notion, but I love my Fairmont Ott lights. I found them at Tuesday Morning for $40 and I don’t know how I ever stitched without them. Thank you for offering such a generous giveaway! Well I’m not sure what qualifies as a “notion” (I have always wondered that) but my favorite quilting tool is my orange quilting gloves from Fons and Porter. They are like “turtle” gloves meaning they have rubber bumps all over to make machine quilting much easier. I have machine quilted many a quilt top with and without and it is FAR easier with these little gloves on. Thanks for the opportunity!!! I want to try the lapel stick and the thread. All your suggestions look awesome. I recently discovered Presencia thread by Hilaturas, USA. It is 100 % cotton but is three ply rather than two ply and I am loving it. My favorite notion isn’t anything fancy but it is something that I couldn’t live without. I love my Fiskars scissors. I use them everytime I sew, therefore, something that I couldn’t live without. A must have for a quilter! I love warm and natural as well! Thank you for the great giveaway! I think that spray baste is my favorite all time notion. I have become addicted to the time it saves in pinning. I still pin some for safety sake but it sure does make quick work of the project. Spray baste would be my all time favorite notion. It makes short work of basting a quilt. Thanks for the great giveaway. I get a lot of enjoyment from your blog. Thanks for the great suggestions & the detailed info on each of these notions. My favourite notion is my Olfa ergonomic rotary cutter, closely followed by my seam ripper. I’d love to give your suggestions a try. Thanks for a lovely giveaway. I love my flat head pins, but, to be honest, I’d be lost without my unstitcher (aka seam ripper). I hope to someday not miss it, but in the meantime, I’m so happy to have one. I love good sharp scissors. I wish I had a few more for snipping threads and other small things. My favorite notion is my Roxanne thimble – I don’t do any hand sewing without it! My favorite hand sewing needles are Richard Hemming and Son large eye needles. Love the list Amy, thanks for the suggestions! I think it is a tie between Lapel Stick and Aurifil for me. Those two things have changed my life sewing wise! My favorite notion is my seam ripper. Is that a bad thing?! The notion I could not live without is my seam ripper. Not just any seam ripper but the exact one I have. I don’t know what brand it is, but I’ve had it since I took Home Ec. class in junior high and it works SO well. It has a fine point so that you can actually get it between/under fine stitches and it rips the thread cleanly every time. In fact, I lost it for a few months earlier this year and went out and bought a new different brand one and it did not meet my high standards after having my awesome one. I have to say that my favorite notion is my ergonomic cutters, I have both the Martelli & the Grace Company one & I just love them, no more wrist problems. For handwork needles, I use John James-tapestry 26 or 28 for anything that isn’t old fashioned embroidery-for that I use Sharps in various sizes. Remember, the bigger the number, the smaller the needle. I love my rotary cutter and mat. Don’t know what I would do without them! I’m still searching for the perfect needles. . .
My favorite notion is my thimble. I cannot live without it and have been known to wear it all day. My finger just feels naked without it. Thanks for this awesome giveaway. Hope I win!! My favorite needle for handwork is the Wendy Schoen #7 darner. They are big enough to hold well and go smoothly through fabric. I always use the ones that are curved for my hand to sew down quilt binding. I also use them for smocking and embroidery. They are also my daugters favorite for embroidery. since I’m still fairly new, I don’t have a notion yet, though I do like my seam ripper! My favorite notion is a pair of Gingher scissors that were my husband’s grandmother’s. I received them after his grandmother passed away. I always think about how she used them when she was sewing. It is a fun way to link my husband in to my sewing too! Winning this giveaway would be a great Christmas present!! My favourite notion at the moment is my blue water soluble marker – I use it to mark all sorts of things on fabric. I’m still new to this, but I love my rotary cutter! I’m looking for a good fabric pencil. Thanks for the chance! My favorite handwork notion is the Morgan no slip embroidery hoop. I already use most of yours, lol. I have a wonderful pair of stork scissors that I bought in Austria in 1973. They are still sharp after all these years. My very favorite notion is Miracle Chalk, which looks like a sliver of soap and marks beautifully then disappears with heat. Runners up are bamboo skewers for use as a stiletto and my magnetic pin holder–no more worries about pins falling to the floor. Thanks for the giveaway. I stuff my own stocking every year and would love to add some fun quilt notions to it. i love flat pins. they are the best. Sharp scissors are a must! I have many pair in all kinds of sizes. So far my favorite pair are Blooms with titanium blades. Yes, I have sewing notions on my Christmas list! My favorite notions are my stork scissors and my stiletto. They don’t get used often, but I love them because they belonged to my Grandmother. I have to go with rotary cutter as my favorite. When I started quilting back in the ice age we used templates, chalk markers and scissors. No way do I want to go back there!! Happy Holidays! I recently tried Aurifil and I’m hooked! I never thought I’d go for the “fancy” thread, but it really is much nicer than the rest. And my machine loves it, too! I love the super thin super long Cover needles. Thanks for the wonderful giveaway! thanks for the pin info – i’ve just been using regular, non-specialized ones and often am frustrated with them. my favorite notion is definitely my rotary cutter – with a fresh blade! I know this will sound so lame, but my favorite notion is my rotary cutter!! That thing was a life saver for me! Do you know that I actually cut out a whole quilt once using a pattern, pins and scissors?!? I didn’t know a thing about a rotary cutter and ruler. That is why I am sooo thankful for beginner quilt classes. Haha! I am new to quilting so I haven’t really figured out the best way for basting. But I’m a huge fan of Dritz Adhesive spray. I’m loving that right now! I love my seam rippers. I have been buying the cheap ones at JoAnn’s Fabric and when I loose them or they get dull I just dump them for a new one. My favorite needle has been the Piecemakers Embroidery Needle set. Great give away! Thanks! My favorite notion these days is my seam ripper. We have spent quality time together the last two times sewing holiday pillowcases of all things. Great ideas for a wish list. I’ve only used the warm and natural batting of the items listed, it is my favorite. I don’t know if my rotating cutting mat would be considered a notion, but it is a favorite. Thanks for the chance at your giveaway. Ooh, I’d love to win any of those, I haven’t quilted in many years (since re-entering the workforce after my children were born) but have a new sewing machine and a grandbaby on the way, and am ready to get back to sewing and quilting. Back when I was quilting, I think my rotary cutter was my favorite notion! I’m no help on the needles either but will read what was suggested by others. Thank you, and I hope you receive lots of things that are on YOUR list! I love your list! I may just give my husband the link to this post! Rulers seem to be my favorite notion – they continue to multiply in my sewing room. I haven’t done any handwork yet, but a friend brought me a Poakalani Hawaiian book back from her vacation so it will be in my future. I just forwarded this list to my husband! Without a doubt my favorite notion in the “Kiwk Klip” safety pin tool. I am a sign language interpreter and my hands are my livelihood. I try to do everything I can to keep them healthy so that I keep signing, and quilting, as long as possible. I had to give up crochet, and quilting was becoming difficult because it hurt my fingers to open and close safety pins, but this tool really saves my fingers! It’s faster too! Hate to be boring, but my rotary cutter and Creative Grids rulers are my favorite quilting notions!! Of course the handy seam ripper is essential, but hate to say my favorite! Thanks for the great giveaway! 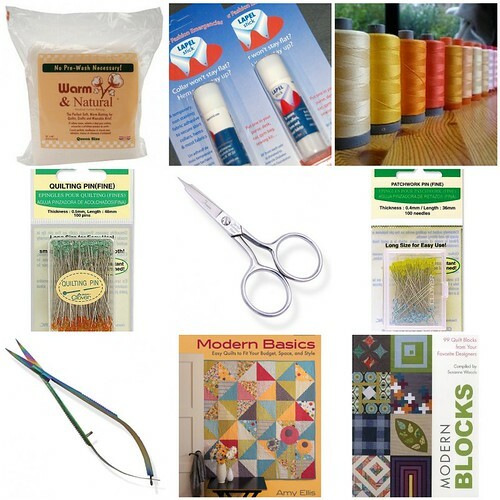 I’d love to try the Aurifil thread and the microtip scissors and thread snips!! My Clover seam ripper has to be my favorite notion – maybe because it is well used:) Aurafil thread is fast becoming my second. Can a 1/4 in. piecing foot be considered a notion? Because it is my lifesaver when piecing! Other than that, aside from the usual thread, I’d have to say paper backed fusible web! This stuff is awesome! My favourite notion is my rotary cutter. I can actually remember the days of cardboard templates, a lead pencil and cutting each piece with a pair of scissors. Thanks for sharing the wish list. Great list :-) And fun giveaway…my favorite notion has to be a sharp rotary blade :-) Need to put a new one on my cutter but I’m being lazy…. My favorite notion is a seam ripper that I use frequently. It fits my large hands well. It has a handle that was handturned on a lathe. My late father gave it to me (he was a woodturner and had a friend make it). Sentimental favorite. Otherwise, I like those long Clover quilt pins too. The other products I have not yet tried. Thanks for the giveaway. You’ve listed some good online shops above (the quilting garden is new to me). My favorite notion? What about marking pens for quilting- hand quilting that is. Thanks for sharing Christmas list ideas and the giveaway. I love my “Big Board” that fits over my old ironing board. It serves as a cutting space and ironing board. I can adjust the height and also it is easily fits into my small work area. I think my favourite notion is my self-healing cutting mat, I used to have 2 but the smaller one seems to have gone AWOL. Hi Amy! Great list, I like lots of things on that list and do need a small pair of sharp scissors, for sure. My favorite notion is the curved quilter’s safety pins for basting my quilt sandwich. I keep them in a big square biscuit. Here’s a tip I just read from Marty Mitchell: leave the pins open when stored, it is one less closure you’ll have to make! Have to say that my magnetic pin holder is one of my favorites! It’s so handy and keeps me out of a mess with my toddler! Thank you, thats is a great posting. On of my favorite notions is John James- Easy Threading Needles. thanks to you, amy and suppliers, for the resource/gift list and great give-away opportunity! I would love the Aurofil thread but honestly they are all items I would make use of! Thanks for the give away. My favorite notion is my “ergonomic” seem ripper. It gets used A LOT so it needs to be comfortable. Thanks for the opportunity! I’ve never used Aurofil thread before but I seem to be seeing it pop up in everyone’s discussion lately:) Thank you Amy for sharing your wish list….it’s a great way to hear about everyone’s “secrets” to successful sewing/quilting!! Hmmm….as for mine I’d have to say I love the binding clips that look like barretts to use when I’m sewing my binding down on my quilts…very handy! Thanks for the great giveaways!!! My rotary cutter is my favorite tool for sure. I don’t just use it to cut strips of fabric with a ruler; I also use it to cut out pattern pieces and simpler applique pieces (when I was making stockings yesterday, I didn’t even think about using scissors to cut out my appliques!) It’s perfect for cutting out multiple pattern pieces at once, whether you want to cut out bags or quilt blocks. Some of the past contestants on Project Runway have even solely used rotary cutters to cut out their patterns. My favorite is a small pair of Gingher scissors that I have at my sewing machine for cutting apart chain piecing, clipping stray threads, etc. I actually bought a second pair cos I was carrying the first pair to the cutting table or ironing board. Well its not really a notion but I read on some quilting blog to use water soluable school glue to attach bindings on quilts. I have tried this and its a great way to do it. Wash the quilt and the glue is gone. So school white glue is my favorite quiltin notion right now. What a great list of goodies! And a giveaway too! My fave notion?? I think it’s the ones that keep me organized so that I can keep sewing and quilting with minimal interruption: my felt needle book, the rubber ring that holds my bobbins, my magnetized pin holder, my notebook sized ironing board pad next to my machine, etc.